A private residential site along the stretch of Tampines Avenue 10 has been put up for sale under the 1H2017 Government Land Sales programme. Probably not the most attractive plot in terms of location, the 99-year leasehold site at Tampines Avenue 10, spanning across an estimated land area of 233,769 square feet (sq ft) has a maximum estimated gross floor area of 654,558 sq ft – can yield approximately 715 homes. The property scene for new launch projects have seen healthy with the brisk sales happening for some of the recent launches, such as The Clement Canopy at Clementi Avenue 1 and Grandeur Park Residences at Tanah Merah. And with the recent easing of property cooling measures by the Singapore government, market researchers are expecting a lift in market sentiments and property developers putting in more bullish bids for land. Analysts have also added that despite the site at Tampines Avenue 10 not being located near the Tampines MRT Station and other amenities in the town central, there will still be demand from buyers who are looking to upgrade. The site is sitting in between 2 other private condo projects (both by MCC Land) along Tampines Avenue 10 – The Santorini (launched back in 2014) and The Alps Residences (launched back in November 2016). As of 12 March 2017 (Sunday), the Santorini has managed to sell 394 units out of the 597 available and the Alps Residences sold a total of 382 out of 626 available since launch, according to the spokesman from MCC Land. 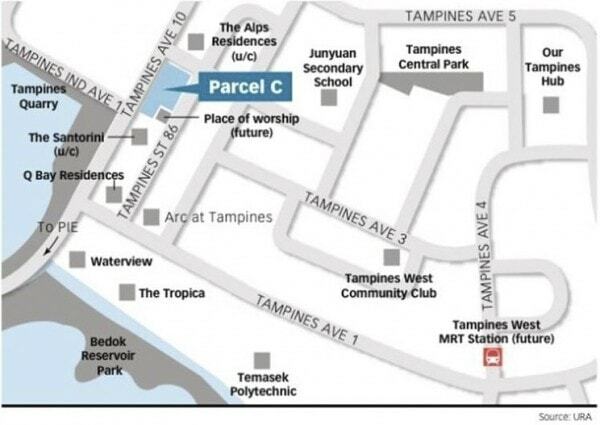 A total of 8 to 14 bids are being forecasted by market watchers for the plot at Tampines Avenue 10 (also known as Parcel C) – with the top bid ranging between S$314.2 to S$340.4 million (or S$480 to S$520 per square foot per plot ratio). The tender will close on 12 noon, 25 April 2017.